“With all of the attention on Labelscar that the mega-mall Mall of America has created I decided to pay homage to one of the smaller malls that I have ever known. Arguably New Jersey, for a state its size, is the King of Shopping Malls. Besides its hundreds of shopping centers everywhere New Jersey is home to such showplaces as the Garden State Plaza and the Cherry Hill Mall. However southern New Jersey was also home to many “mini-malls”, malls that were anchored by a junior department or discount store and/or a supermarket. 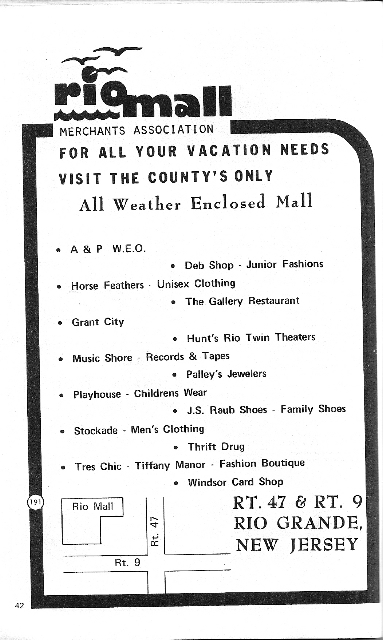 These malls contained about a dozen stores located between the anchors where shoppers could support these businesses where “every day is like Springtime” (from an old Cherry Hill Mall advertisement). Centers like the Cinnaminson Mall, the Tri-Towne Mall in Marlton, and the Village Mall in Willingboro are now a distant memory for many as the novelty quickly wore off. But nobody pulled off the “mini-mall” better than the Rio Mall. The Rio Mall is (was) located in the southern tip of New Jersey four miles north of Cape May. 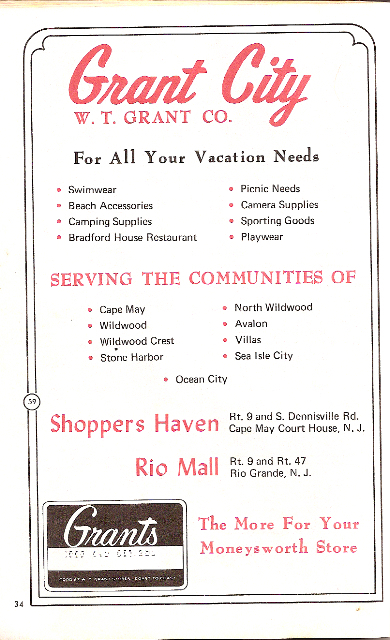 Cape May County in the early 1970s was still quite seasonal and, besides a few small centers, serious shopping was still a half hour north near Atlantic City. In came the Rio Mall. The Rio Mall was built in 1973 in Rio Grande, NJ. It was a novelty for its time. The closest indoor mall, the Shore Mall 30 miles north, would actually not complete its final construction with its new glitzy Steinbach store until 1974. The Rio Mall had no big department store. It was anchored by a Grant City, an A&P, a movie theatre, and about 15 other stores. Each store in the mall basically served one of every type of need. From the start, the Rio Mall was a success. It was constantly occupied but not just by local fly-by-night storefronts. The mall, unlike most “mini-malls,” had a full Deb Shop, JS Raub shoe store, Thrift Drug and the upper-end branch of Atlantic City’s famous Palley’s Jewellers. With little competition and the fascination of indoor shopping Cape May County was happy. The Rio Mall wasn’t necessarily a mall where you could browse all day. But if you wanted a new pair of shoes, wanted to fix your watch, needed to buy some cards and catch a movie it was “one stop shopping”. Even when Grants closed their doors with the rest of the chain in 1976 the anchor store did not stay dark for long. In came K-mart. Even Atlantic City didn’t have a K-mart until after Woolco closed its store in 1982. 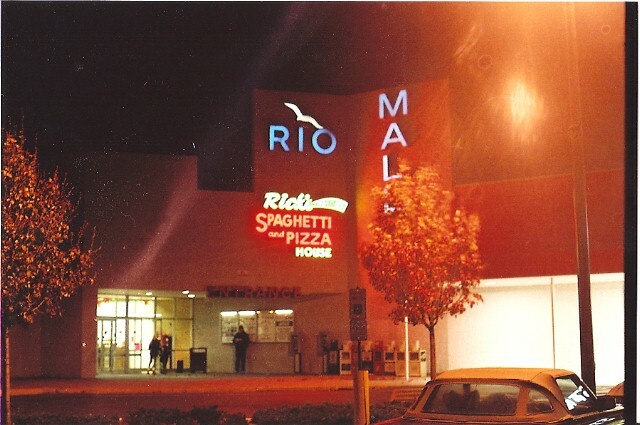 For years the Rio Mall served the county well. Along the way it lost some stores but they were quickly replaced by such chains as Rafters, a NJ woman’s clothing store and a (small) Reynolds junior department store. But then the area became more year-round. Demand for shopping grew. Soon some of the earliest power centers would invade its territory. JCPenney built a new store down the street along with Peebles. Thrift Drug merged with Eckerd and left to a store next to Starn’s Shop-Rite. Reynolds moved into a “real” storefront across the street. Palley’s closed all of their stores. By the mid 90s the exodus was in full swing. Slowly the mall began to die. It tried to survive but for many it was time to move on. From the look of Michael’s photos, I really didn’t miss anything–at least not nowadays, anyway. I’m am, however, glad for the chance to see what it was like–thanks Michael! Anyone know anythign about the Tri Towne Mall/plaza in marlton? Just curious. Nice to see you back, Jason. The first place this mall, to which time hasn’t been kind to, reminded me of is Sun-Vet Mall in Holbrook, New York. A simple one-corridor mall who serves the very same sub-one-stop-shop necessity appeal. You know, before huge malls became the standard. The first two photos, nighttime exterior and interior, were taken in November 1994. It was still quite active at that time. 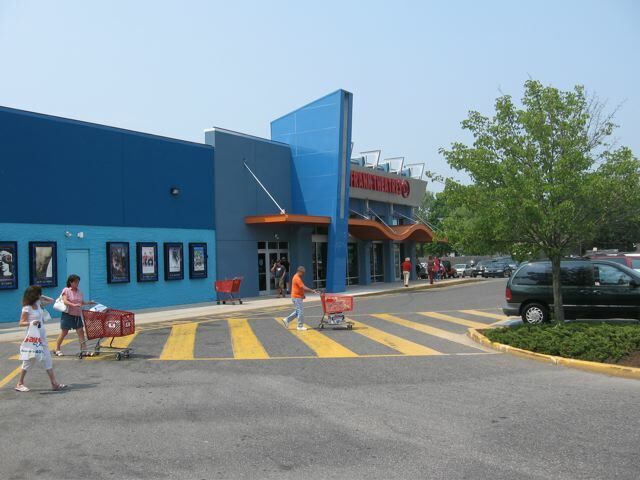 Tri Towne Mall in Marlton was also one of those one corridor malls which, like the Rio Mall, connected the Kmart to an A&P. (There was never an interior entrance for the Kmart.) It was also smaller than the Rio Mall. I remember there being a CVS (no pharmacy and with interior and exterior entrances) a Baskin-Robbins, a library branch, and probably about 10 other stores. It didn’t serve much of a purpose but I guess shopping center developers at the time were still trying to capitalize on that “everyday is Springtime” enviroment. Having a mall near a Jersey shore town is always good, especially when a it’s a rainy day. On my last Stone Harbor trip, I remember driving past this mall and didn’t think too much of it…sad to hear about its demise. An example of this type of mini-mall that comes to mind is the Headquarters Plaza in Morristown. Back in its heyday, it was anchored by a nice 2 level movie theater (Headquarters Plaza 10…it had a $3.75 all shows student admission back in my 1st year in college), Bennigans and had about 10-15 smaller stores including Sam Goody (old music store), along with being connected to the Headquarters Plaza Hotel. Last time I was there, all that was left was a County College of Morris Office and the Movie Theater, which still gets a nice crowd, but you are reminded of the dead mall as you pass through the un-renovated, dark corridor from the parking garage elevator to the movie theater. I haven’t been to HQP in a while and I’m sure that when Hyatt purchased the HQ Plaza Hotel, some changes were made. Located just up the block from The Green, Headquarters Plaza has also suffered from a lack of adequate pedestrian access. Speaking of Morristown, their retail history is quite interesting…The Green is the Center of Town and the West, South and East Sides have been fairly successful for years, but the NW Corner was dead for 13 years since Macy’s closed, but now is successful with the opening of the Century 21 Department Store. The South Side of The Green with Epstein’s closure (a local dept store) is now the ‘dead area’ and now that the building is razed, they are re-devleloping the area for mixed use…we’ll see how this progresses. Despite the lack of consistency retail wise, Morristown still has many great restaurants, bars and cultural activities. Living near Morristown myself, I really enjoyed reading Mallguy’s comments on Headquarters Plaza. Perhaps the only things that I can add about that mall are the following: First, that mall is often criticized for its ugly appearance, given that its modern look is in stark contrast to the rest of Morristown’s Green, which has a very beautiful, colonial look. And second, Headquarters Plaza was also hurt badly by the fact that it is located near a ghetto, as well as by the fact that crimes have taken place in the mall’s huge parking garage. Like Mallguy alluded to, Morristown itself has a very interesting retail history. Epstein’s Department Store–which closed in 2004 and has since been razed to make room (mostly) for condos–was one of the most beautiful and unique department stores that I’ve ever seen. In particular, it was well regarded for its outstanding customer service and community involvement. And, of course, there was also Bamberger’s, which opened in 1949 (some 20-plus years after Epstein’s opened at its South Street location). One interesting note about the brick Bamberger’s building was that it had (and still has) sculptures of a dozen or so major figures of the Revolutionary War hanging across the top of the building. (The city of Morristown played an important role in that war.) Bamberger’s was a very popular store in Morristown; however, the store’s popularity declined drastically around the time it changed its name to Macy’s. Sadly, Macy’s decided to completely neglect this store, and eventually decided to close it during its second round of bankruptcy closures in 1993. And now, onto a slightly different topic: Rather than reminding me of Headquarters Plaza Mall (like what was the case with Mallguy), the Rio Mall actually reminded me of the Morris County Mall in Cedar Knolls, NJ. To the best of my knowledge, the Morris County Mall was built in 1973, and was anchored by Bradlees, Thrift Drug (which became Eckerd in 1997 and will soon become RiteAid), and a Foodtown Supermarket. The entire mall was the length of a small hallway, connecting Bradlees to Thrift Drug. 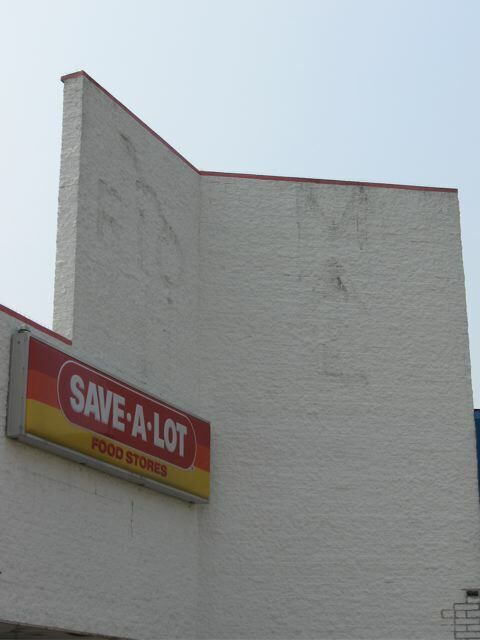 (The Foodtown–which was right next to Thrift Drug–never had a mall entrance.) Up until the mid-90’s, the mall was fully filled with shops, including McDonald’s, Thom McCann, The Ground Round, W. Kodak Jewelers, Game Time (an arcade), Radio Shack, and a Sherwin Williams Paint store. One by one, however, virtually all of these stores closed in a very short time period. While Bradlees, Thrift Drug/Eckerd, and Foodtown never closed in the 90’s, the McDonald’s was the only place in the interior section of the mall that was still open by the decade’s end. The last time I was ever inside this version of the Morris County Mall was in January 2001, when Bradlees held its going out of business sale; at that time, McDonald’s was still open. 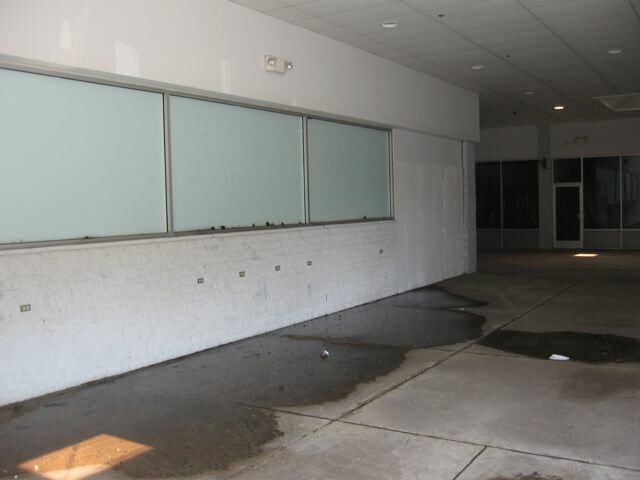 The Morris County Mall completely transformed itself after Bradlees closed, but before Wal-Mart came to take over the empty Bradlees space: The entire interior portion of the mall was gutted, to make room for stores that were part of an outdoor strip center. Today, the Morris County Mall (which it is still called, despite the fact that it really is no longer a mall) is again very successful, housing Wal-Mart (as mentioned above), McDonald’s (which relocated), Sears Hardware, TJ Maxx, an All for a Dollar store, Eckerd/Rite Aid (which never re-located), and Foodtown (which also never re-located). Interestingly enough, the strip center still has a very small indoor “mall” portion to it (that I believe is new construction that was not originally part of the old mall), which contains Radio Shack along with a couple of restaurants. When was it when the Rio Mall sign was taken down? I thought I remember seeing it not too long ago. Goodness I have not thought of this place in years. I grew up in that area. 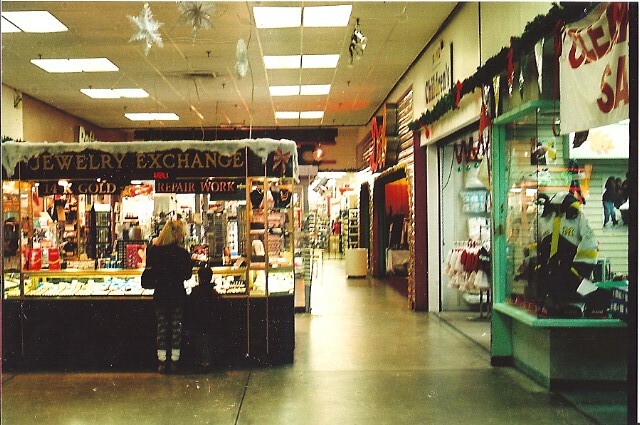 Actually, the photo of the woman at the jewelry exchange looks to be my mother and youngest brother. She use to go there all the time since a neighbor worked at that kiosk so I would not be surprised if it was her. That picture I would bet was taken in either 1988 or 1989. That was the time the mall always had people in it. I spent a good portion of my childhood there. It was the only place to really shop down there. 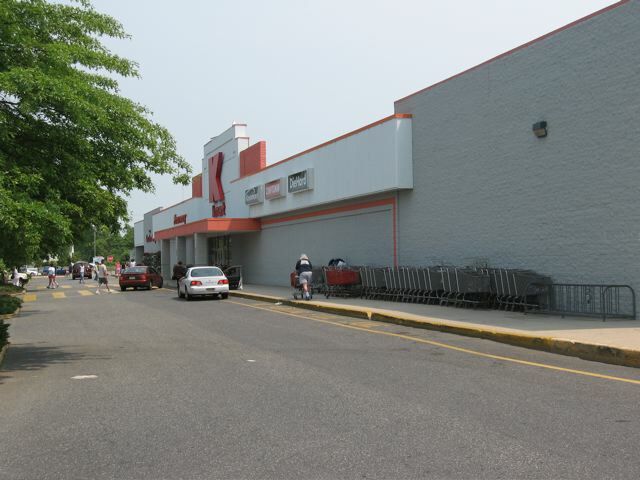 I remember the K-mart entrance from the mall and you would have to go through an iron gate of some sort since they did not want their carts in the mall. You had the DEB shop with Rafters across the way. Then there was a childrens clothing store next to the DEB. Then you had a shoe store, the hallmark store and then Radio Shack. On the left side of the photo you had Rafters, then a fancy jewelry store of some sort on the the corner. We only went in with my grandmother. Then around the corner as you headed to the front entrance you had Hairport Salon and a Record Store on your right. On your left on the way out you had Thrift Drugs which in that day also had the JC Penny Catalog pick-up in the rear of the store. Beind you in the picture would be Rick’s Pizza which had some greasy pizza and then next to that you had the movie theater. Out in the mall in front of the movies you had arcade games lined up against the wall and then it all lead to the rear entrance. There was a variety of kiosks in the mall itself also. I remeber to the left of the indoor photo there was always a Santa Clause there for pictures during Christmas. So that is where as a kids we would visit Santa. Many of my Christmas wishes were told there. In 1991 K-mart went through an expansion and remodle to the rear of the building. When Rio Grande Plaza was built down the road with the remodled Shop Rite and the demolition of the only drive-in movie theatre, things began to die there. 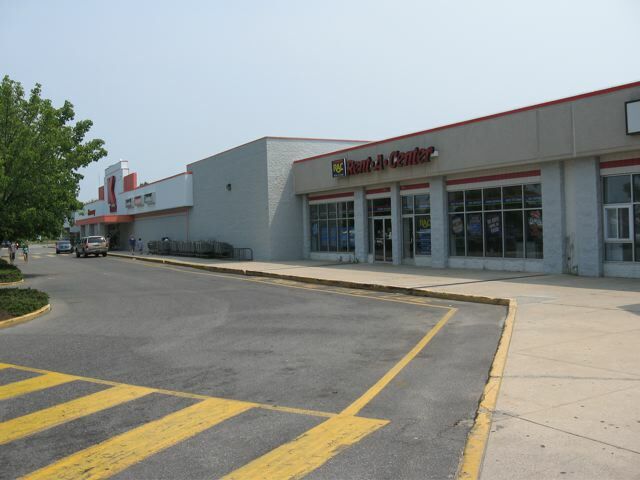 Thrift drugs, the halmark store and Radio shack all moved out to the Shop Rite Plaza. The other spaces remaind empty. The jewelry store moved out and was replaced by sports/hobby shop that lasted about 2 years. The record store eventually closed and then the hair salon moved to another strip mall across the parking lot. Ricks pizza continued to get worse and you would never see in anyone in there. The movie theatre at one point had $1.75 tickets to see movies that were out on VHS but still a place to hang out with friends. But time and neglect got the best of it. I would say what remaind at that point held on until 1998 or so when K-mart expanded into the mall from where the jewelry exchange was back. That all became that store room for K-mart. 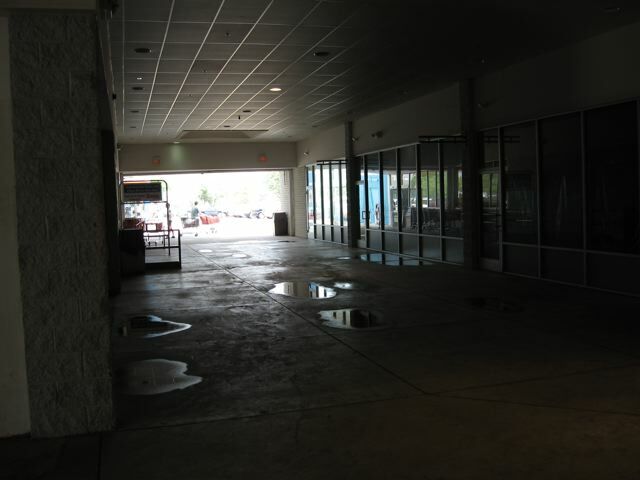 So the access to the mall was cut off from K-mart and so did the life of the Rio Mall. As you can see I have strong memories of the place. I remember everyone would hang out there at the front entrance and you only prayed to God that you were not caught coming out of K-mart. @NJ Shore Boy, Where was the A&P at? It certainly looks like it was at a different location than it is now (the A&P would later become Save-a-Lot). I am so happy to have found these photos of the Old Rio Mall, my very first job was in J.S. Raub shoe store. We all hung out and shopped there when we were off. This place is a part of my history, it is so sad to see what it has become. prob and the owner called her personally to resolve. The funny thing now is that I have presently relocated in Morristown. So I am seeing the new developement take place here. I had always wondered about the Morristown Mall / Wallmart. The first time I saw the little area where the present McDonalds is and the other random shops inside in the small area that has been preserved reminded me of a limbo area of what the Rio Mall once was and now is. At least for the present businesses there the place is busy. It is impossible to find place to park when there. Now for downtown Morristown around the square, I have been avoiding there is too much congestion and there is a lot of construction on south side of the square. it wasnt a mall when I was there. and how well does Kmart do? I grew up in Cape May, about 10 minutes or so down Route 9 from Rio Grande. During the 80s and early 90s, this was not only THE place to shop, it was really the only place in southern Cape May County to shop, as NJ Shore Boy mentioned. If you wanted something that didn’t have shells or the name of a town on it, you came here. I was a kid during this mall’s 80s and 90s heyday. I didn’t really pay much attention to Rafters or Palley’s, and I never liked the Deb Shop. (I still don’t.) I believe the store next to the Deb Shop was Monkeys’, a children’s clothes store. If you look closely, you can see some of the fancy, frilly little girl dresses my sisters and I admired peeking out of the storefront. The record store was a favorite of my mom’s. Most of her considerable record collection was purchased there. It was sad to see how badly this died once everything moved further east, closer to the ramp to Wildwood. I remember running through the remains of the mall in the mid-90s and how spooky it seemed, even with Rick’s and the Deb Shop still open at that point. While I moved out of the area in 2006 (I now live in Oaklyn, just outside of Philadelphia in South Jersey), my mom and stepdad still live in Cape May County. As of spring 2014, the Reynolds was replaced by a large Family Dollar. K-Mart seems to be holding its own against Wal Mart, which makes me very happy; I have so many fond memories of that store. Save-a-Lot is still in what I think was Thrift Drug. JC Penney, Radio Shack, and Hallmark remain in the Shop Rite mall. 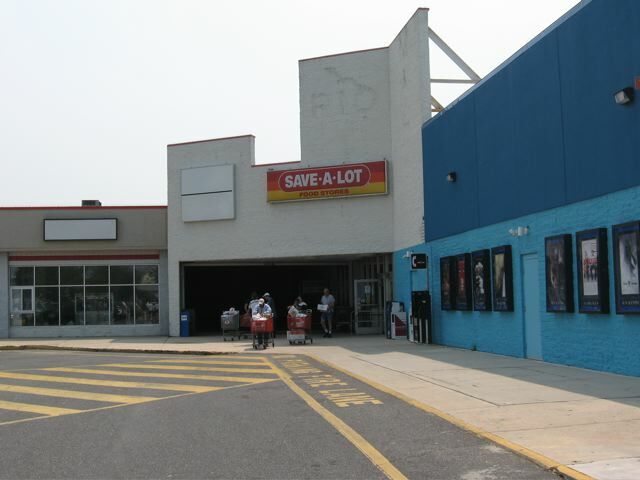 The movie theater is very popular, as one of the few year-round theaters left in Cape May County – my mother frequently takes her grandsons to see movies there. i was 16 when the mall opened. Loved Horsefeathers and the Deb Shop. My first credit card was J.C. Penny and you could use their card at the thrift drugs store for prescriptions. Now ex husband. I think my first nice watch came from the jewlrey store. I remember shopping at the Grants clearance sale. Still live nearby, it’s a little sad now, it did seem like a big deal for the area at the time it opened.